You can't be a hero without an awesome theme song! 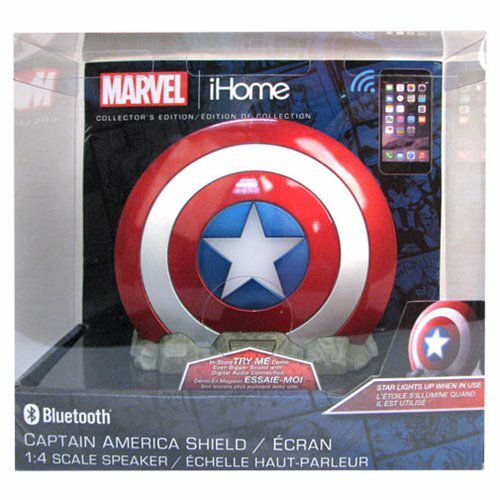 Provide your own background music with the Captain America: Civil War Shield Bluetooth Speaker. The Bluetooth speaker wirelessly streams audio anywhere from up to 30-feet. Providing powerful sound performance, it also allows you to answer and end speaker-phone calls. The speaker lights up when it's in use and includes a rechargeable lithium-ion battery. Includes 1x 3.5 MM AUX/USB cable. Measures approximately 6-inches wide by 5-inches tall. Ages 13 and up. Bring the Noise with Captain America: Civil War Audio Products!